Bucks Destroyed in '09 Debut ~ The Bucky Channel - The World of Sports from Wisconsin's Perspective. 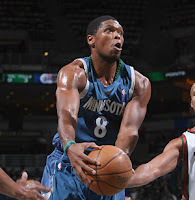 It was all Timberwolves Monday night as Minnesota stormed over the Bucks 117-79 in the preseason opener for both teams. This is sure to be one of the more interesting preseasons in recent Bucks memory as the club is only returning six players from a year ago. Couple that with the arrivals of Richard Jefferson, coach Scott Skiles, and GM John Hammond, and there is definitely some actual real life interest in the Bucks this season. The Bucks kept many of their main rotation players off the court tonight due to various, yet non-serious, injuries. Andrew Bogut, Tyronn Lue, Joe Alexander, and Luke Ridnour were all kept out of last night's action. That left ample playing time to some of the guys who will be contending for starting gigs and minutes once the season commences. Charlie Villanueva lead the Bucks with 14 points, while Ramon Sessions had 11 points and six dimes. Rookie Luc Richard Mbah a Moute had nine points in 26 minutes of play. The coolest part about last night's game were that tickets were free, and 9,873 fans took advantage of that. Free tickets for a preseason game. Pretty smart move by the NBA, a league that realizes these contests do not provide the same level of excitement and play as a regular season affair. Are you listening, NFL? The Bucks are staying busy over the next couple of weeks, as they'll be heading to La Crosse for a matchup with the Mavericks this Friday. The day after that, they'll be taking on Detroit in Milwaukee. Even though the team has traded away Yi Jianlian, the Bucks are still heading to China for a pair of preseason games with the Golden State Warriors. Both games will be televised by ESPN2. So while the Bucks did get killed last night, anyone who takes stock in preseason records is wasting their time. A lot of the new guys and more of the young guys earned some valuable minutes last night, which will go a long way as this team tries to rise from the cellar of the East back into the Conference playoffs. Agreed, plus Jefferson and Redd played a total of 25 minutes combined..... so yeah, who cares about Pre-season. Mrs. Edwards, We Found Your Son! Take A Sip, Won't You? Should Melvin Offer Sveum the Job?